I have finally succumbed to the blandishments of the modern world and bought a cell-phone. Not, I hasten to add, because I have any desire to talk to people, gracious no, this device has no service. Simply because I was tired of my point-and-shoot cameras dying after a year or two of use. As I far as I can tell, the most common point of failure in my point-and-shoots has been the part where the servomotors extend the lens. Either when it is turned on, to focus, or to zoom. But a cell-phone’s camera has no external moving parts that rain or fog can corrode. So I thought I’d try a cell-phone as a replacement. I did some research, no one seems to take cell-phone cameras very seriously, I couldn’t find any of the data I wanted (like quality of macro pictures). But the Samsung Galaxy S5 seemed to get vaguely good reviews, so I bought a used one — and that, a year after its release, was only slightly more than a good point and shoot. It doesn’t take as good pictures. I take pictures for two reasons, 1) to have a picture (this usually needs a good quality macro lens) and 2) to remind myself of what, when and where I saw something. I do a lot more of the second type than the first at the moment, and the cell-phone is adequate for that purpose. But it is also a small portable computer. 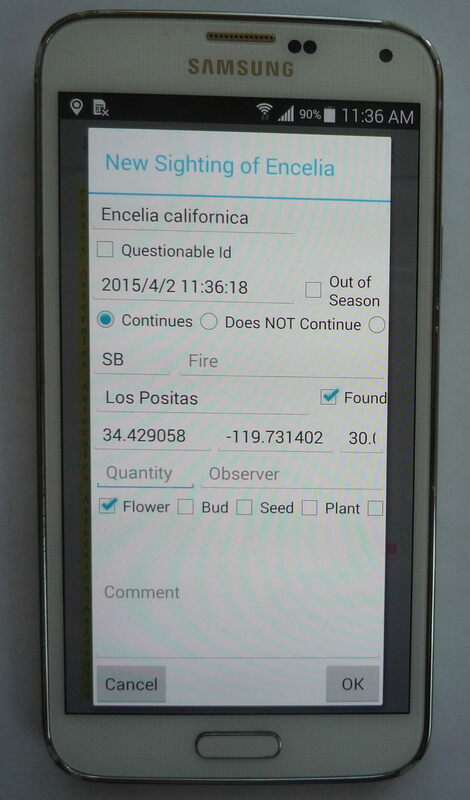 And I have ported my wildflower database program to the cell-phone now. The main display shows a list of all species I have seen, photographed and identified in SB county (with a little spill over into Ventura, Kern, LA, and SLO). 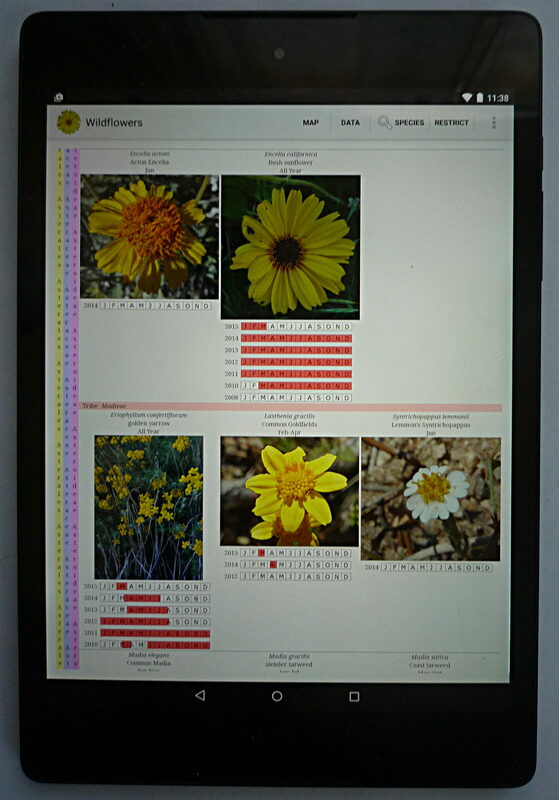 Each species has a picture (which defaults to the flower but can be either plant, leaf or seed as well), a latin and common name, and a blooming period. 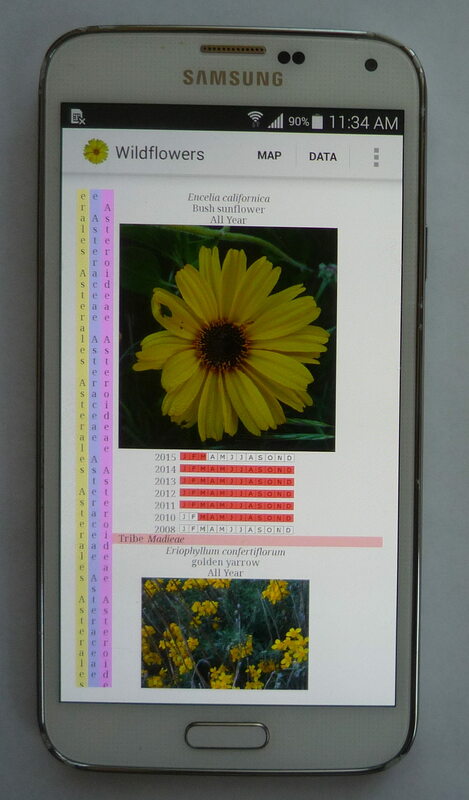 Underneath the image are little calendars showing when I have seen it blooming in the past. There are ways to restrict the species displayed. One could ask to see all yellow flowers that bloomed in April on Jesusita trail, for instance. On the phone it’s rather squinchy, only about one species can be seen. It’s a bit better on a tablet, where there is some context around each species. In fact I did that this morning in my run up Jesusita. I used my phone to add 93 sightings. It took about 2 hours to get to the top (which is very slow, so I need to speed up the workflow somehow), and crashed 4 times, but it didn’t lose any data. And that’s what is most important. It can also show you where the plant can be found, either by drawing a map, or by giving you directions on how to get there. Each of the little blue circles represents a location where the plant was seen. 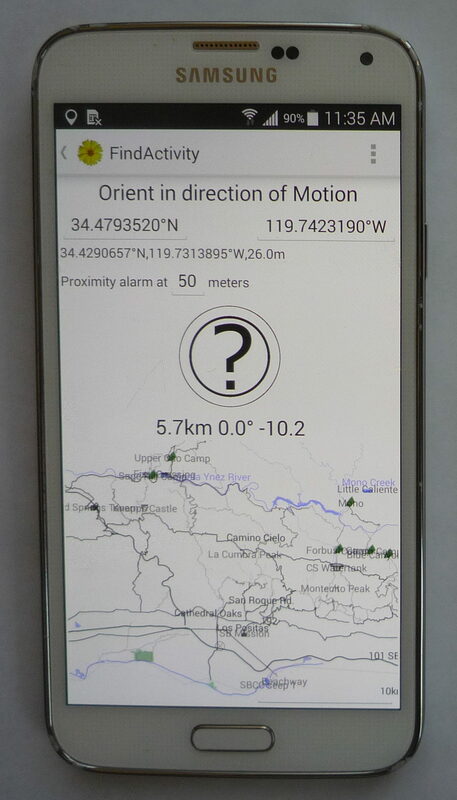 If you put your finger on one of them (or indeed anywhere on the map) you get the following display which will tell you how to get to that location from where you are now. Once you start moving the big question mark will turn into an arrow showing you the direction you should be moving to get to the desired location. 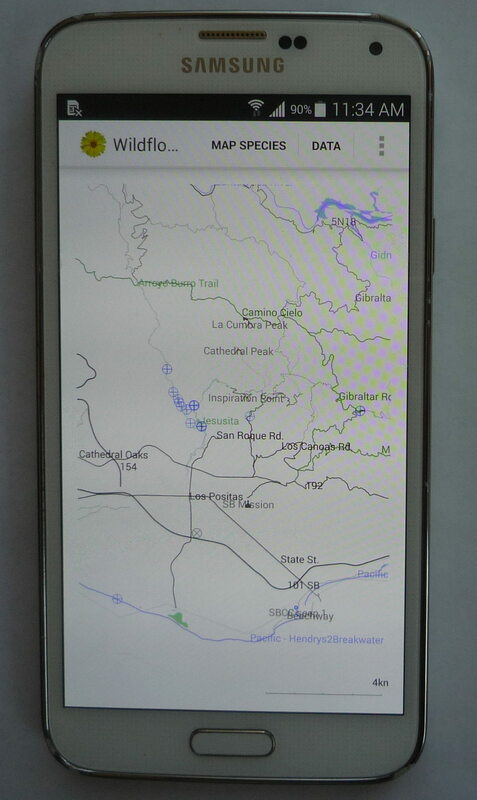 Would anyone local be interested in having this installed on their android device? (doesn’t work on iPhones, and is still much under development, but it has some basic functionality now).